A site in Germany revealed that the Mini Galaxy S3 ( GT - i8190 ) will have a design that is very similar to the ' brother ' but with a smaller size is 121.55 x 62.95 x 9.85 mm.And from the photos, the most visible difference is the presence of the line LCD lights around the home button and the position sensor . Mobile is mentioned already using the latest version of Android 4.1 Jelly Bean with specs 1GB RAM, 16GB internal storage , 1GHz dual core processor ( ST - Ericsson U8420 ) , a 4 " AMOLED LCD 800 × 480 resolution , 5 megapixel camera + VGA front , NFC ,WiFi a / b / g / n ( 2.4GHz/5GHz ) , Bluetooth 4.0, microSD slot and a capacity of 1.500 mAh battery . 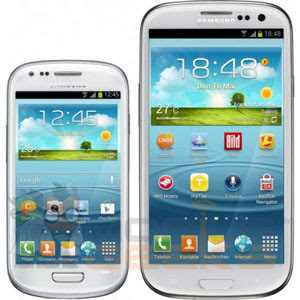 Mini Mobile Samsung Galaxy SIII will be announced officially tomorrow in Germany , so we wait for the specs and the photo above is true. 0 Respones to "Pigture and Specs of Samsung Galaxy S3 Mini"